Electricity generating companies and power system operators have the problem of deciding how best to meet the varying demand for electricity, which has a daily and weekly cycle as well as some longer-term issues. Their short-term optimisation problem is how to schedule generation to minimise the total fuel cost, or to maximise the total profit, over a study period of typically a day, subject to a large number of constraints that must be satisfied. In the longer term, an electricity company needs to purchase fuel and/or trade fuel and power contracts and satisfy any emission constraints it may have. If an electricity company has responsibility for satisfying the demand for electricity, then its most important short-term constraint is that the total generation must equal the forecast demand in each time-interval (which is typically 30 or 60 minutes long). Alternatively, a generating company in a deregulated electricity market may not need to match its demands exactly, but it will have to decide at what prices to offer its generating plant to the market at different times of the day. There are two related short-term optimisation problems, 'unit commitment' and 'economic dispatch'. Unit commitment is the process of deciding when and which generating units at each power station to start-up and shut-down. Economic dispatch is the process of deciding what the individual power outputs should be of the scheduled generating units at each time-point. Unit commitment is a very challenging optimisation problem, because of the astronomical number of possible combinations of the on and off states of all the generating units in the power system over all the time-points in the study period. For planning purposes, the same optimisation problems need to be solved over a longer study period, such as a year, in order to allocate resources in the most effective way. Power Optimisation is an independent consultancy, which develops unit commitment software called Powerop for electricity companies. This software considers both unit commitment and economic dispatch simultaneously, which improves the quality of the calculated generation schedules. Power Optimisation has another software application called Planner, which automates repeated runs of Powerop to cover a longer study period. Planner is able to optimise whilst taking into account longer-term issues such as fuel contracts and emission limits, and it also allows for both scheduled maintenance overhauls and random breakdowns of generating units. Powerop can be used by power system operators to schedule and dispatch the generating units in their power systems, to produce very high quality generation schedules that take into account all the important constraints on the power system and on the generating units. The software has a number of features that are suitable for the particularly difficult problems faced by the operators of power systems on islands. Powerop is being used for self-scheduling by some major generating companies under the British Electricity Trading and Transmission Arrangements (BETTA) in the British electricity market. The software is also being used to forecast System Marginal Prices and the usage of generating plant and fuels in the Single Electricity Market (SEM) in Ireland. The generation schedule produced by Powerop is always feasible, that is it satisfies all the defined constraints provided the data are self-consistent. If the data or constraints are not self-consistent and a feasible solution does not exist, the less important constraints are relaxed automatically so that a usable schedule is still produced. The generation schedules produced are better than those that can be found manually or by 'priority-order' methods, leading to large savings in annual fuel costs and higher annual profits. A wide variety of constraints and plant types can be modelled, including complicated scheduling constraints, non-linear cost curves, energy-limited plant, power-purchase agreements and emission constraints. It is relatively easy and quick to introduce new constraints and features and to modify Powerop as circumstances change. Powerop is robust to changes in operating conditions and relative fuel costs, because no prior assumptions are made about the nature of the solution. As a result of using a proprietary multi-stage version of the MILP method, Powerop finds very good feasible schedules much faster than if it were to use the standard MILP method. It does, however, have an option to use the standard MILP method for comparison purposes. For long-term planning purposes, the use of Powerop together with its associated application Planner means that long-term optimisation is combined with a very accurate model of short-term generator scheduling. This makes their results much more realistic than those from the approximate models that are often used for such purposes. This also means that there is no mismatch between short-term generator schedules and longer-term plans. The objective of the optimisation is to minimise the total fuel costs over the study period whilst satisfying the appropriate constraints. Alternatively, the objective of the optimisation can be to maximise 'profit', defined as the total revenue from electricity sales minus fuel costs. The study period is divided into time-intervals chosen by the user, which are usually half-hourly or hourly (but longer or shorter time-intervals can also be used). For most power systems, study periods of up to a week with half-hourly time-intervals can be solved to good accuracy by Powerop within an acceptable run time. For very large power systems and / or longer study periods, Planner can be used to automatically perform repeated linked Powerop studies which can optimise limited resources over the long-term. The software can model the operation of both thermal and hydro-electric generating units and of electricity contracts with other companies. Thermal generating units can include coal-fired, oil-fired, gas-fired and nuclear-powered steam turbines, and combustion turbines burning distillate (which are often called gas turbines). 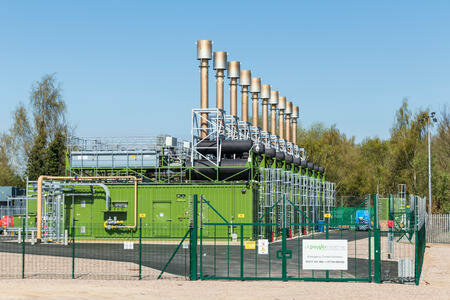 Thermal units can also include dual-fired generating units, which can use one of two alternative fuel types. The software can model and optimise the use of mixtures of different fuels and/or gas contracts in the same generating unit or group of units. The hydro-electric units can include conventional hydro units and pumped storage units. 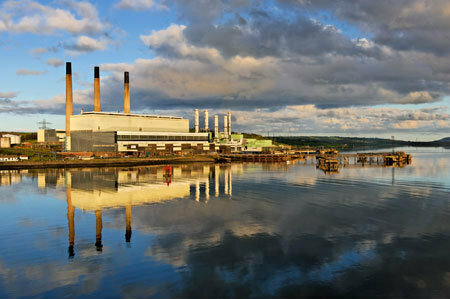 Gas-fired units and hydro-electric units are treated as energy-limited plant. Upper or lower energy limits may also be applied to other types of generating units and may be used, for example, to represent limited fuel supplies or ‘take or pay contracts’. The total output of all the generating units must be equal to the forecast value of the system demand at each time-point. The penalty for not doing so is set by the user, so this constraint may be made ‘hard’ or ‘soft’, depending on the user’s requirements. The total spinning-reserve from all the generating units must be greater than or equal to the spinning-reserve requirement of the system. This can be a fixed requirement in MegaWatts (MW), a specified percentage of the largest on-load output of any generating unit, or a combination of the two. Again, the user can choose how strongly to enforce this constraint. The purpose of the spinning-reserve requirement is to ensure that there is enough spare capacity from the generating units that are on-load or 'spinning' at any time to cover the accidental loss of any individual generating unit, or to satisfy demands that in practice are higher than their forecast values. The precise definition of how much spinning reserve a particular generating unit supplies can be customised to the user’s requirements. Several different spinning reserve requirements may be imposed simultaneously, with each reserve requirement being over a different time-scale. The software can also model standing reserve. This is reserve that is provided by generating units that are currently off-load but which can be started-up and dispatched within a relatively short time, such as 10 minutes. The software can equalise the outputs of identical generating units at any one time, but only if this does not cause violations of any other constraints. The user can define groups of generating units, which are in export or import-limited transmission-constrained zones. The total import or export of power from these zones must be less than or equal to a specified transfer limit, after taking into account the forecast local demands in the zones. Reserve can also be included in the definition of export transmission constraints. Each generating unit has a 'no-load' or fixed operating cost and a number of incremental operating costs, which can define a non-linear profile of operating costs. These costs can alternatively be expressed as fixed and incremental heat rates multiplied by a fuel cost, in which case the fuel costs can vary over the study period. The incremental costs or heat rates modelled by the software do not have to be monotonically increasing with increasing power output. Each generating unit has either a single start-up cost, or a number of warmth-dependent start-up costs, corresponding to a number of warmth states (for example hot, warm and cold) of each generating unit, determined by the time that particular unit has been off-load. Also modelled is works power, which is the power taken from the electricity grid when running a particular generating unit or before a generating unit is synchronised with the grid. Like start-up costs, works power can be warmth-dependent, depending on the warmth condition of the generating unit when it starts-up, as determined by the time that unit has been off-load. Each generating unit can have minimum on and off times. There can be upper limits on the numbers of start-up events of each generating unit per day and also over longer periods. The user can specify inflexible running of generating units. This forces a generating unit to run over a specified time-period, with an output not less than a specified value. Alternatively, the output of a generating unit can be forced to be equal to a specified value over a specified time-period. When a generating unit is on, its power output must be at or above its Minimum Stable Generation value, except when the generating unit is starting up or shutting down. The output of a generating unit must not exceed a specified maximum value. The user can specify capacity restrictions on generating units. These reduce the maximum outputs of the units over specified time-periods. Alternatively, the user can specify different values of the available capacities of generating units in different time-periods (this is called 'profiling the availabilities'). Each generating unit has multiple-segment spinning-reserve characteristics, which depend on the output of that unit. Generating units can be subject to warmth-dependent run-up rates. When such a unit starts-up, it begins operating at a power output at or below its Minimum Stable Generation (MSG), and it runs-up to MSG by following a warmth-dependent non-linear run-up profile, depending on the time that the unit was previously off-load. Above MSG, this profile also defines an upper limit to the power output. In a similar way, run-down rates (which are not warmth-dependent) apply when a unit shuts-down. Generating units are also subject to maximum loading and deloading rates, which apply when running continuously above Minimum Stable Generation. There can be 'station synchronising intervals' and ‘station desynchronising intervals’ at some power stations. These are minimum time gaps between the start-ups and shut-downs of generating units at the same power station. The software can optimise the use of 'pumped storage' hydro-electric units, taking account of the energy lost in the pumping cycle. In other words, the software optimises the times and amounts by which to pump and/or generate from the pumped storage units. The water stored in the upper reservoir of the pumped storage units can be kept between specified upper and lower limits, to prevent spillage or drainage of the reservoir, allowing for any inflow of water into the reservoir. The user can specify minimum, maximum and target values for the reservoir level at the end of the study period, and possibly also target levels at various times within the study period. He can also determine how firmly those target levels are enforced by choosing appropriate penalty costs. An electricity contract with another company can be modelled as a pseudo-generating unit or as a ‘demand’ unit. This option offers all the features described above, for example ramp rates, energy limits, and minimum on and off times, which can be useful if the electricity contract contains such features. The software also has an option for the direct modelling of the electricity contracts which are offered on power exchanges or by electricity brokers. Electricity contracts (also known as power contracts) may be of type ‘buy’ or ‘sell’. The software models the details of the electricity contracts that are offered on the British contracts market. Electricity contracts may optionally be grouped, so that if one contract in a group is accepted then all the other contracts in that group must be accepted. This direct modelling of electricity contracts allows the software to consider a much larger number of such contracts than if they were modelled as pseudo-generating units. This provides guidance to the electricity company as to which contracts to accept and at what volumes, in order to maximise profits, whilst taking into account the knock-on effects of accepting those contracts on the outputs of the physical generating units, including the effects of ramp rates. At the user’s option, Powerop can either use specified values of the initial conditions or it can choose its own initial conditions. Using specified values of the initial conditions would be appropriate for short-term operational use. The option of letting Powerop choose its own initial conditions is suitable for longer-term planning purposes. The software can be used to optimise the import and export of power from and to neighbouring electricity utilities via one or more interconnectors. The software can also be used in a ‘what-if’ mode, to evaluate the costs or benefits of proposed power transfers across the interconnector. Alternatively, generation and demand may be modelled on both sides of an interconnector, with user-specified half-hourly or hourly values for the limits on the flow across the interconnector, which then behaves like a transmission constraint. It is also possible to treat the demand requirements as being ‘harder’ on one side of the interconnector than the other. The software is able to use pseudo-generating units to model different modes of operation of generating plant, with logical constraints defined by the user preventing simultaneous operation of any incompatible modes. For example, the user might define different pseudo-generating units in the software’s input data for the following modes of operation of a Combined Cycle Gas Turbine (CCGT) power station that has two gas turbines and one steam turbine: Mode A is Gas Turbine 1 operating in ‘open-cycle mode’, Mode B is Gas Turbine 2 operating in ‘open-cycle mode’, Mode C is Gas Turbine 1 operating in ‘combined-cycle mode’ with the Steam Turbine, Mode D is Gas Turbine 2 operating in ‘combined-cycle mode’ with the Steam Turbine, and Mode E is Gas Turbines 1 and 2 operating together in ‘combined-cycle mode’ with the Steam Turbine. The thermal efficiencies, ramp rates and other data items of these modes will not all be the same. This can be modelled by Powerop using pseudo-generating units and appropriate logical constraints specified by the user. Emission limits from various pollutants in fuels. Fuel-supply contracts (particularly for gas) and fuel constraints. Maximum numbers of start-ups for individual generating units (particularly for gas turbine plant, which commonly have a requirement for a maintenance overhaul after a certain number of start-ups). Scheduled overhauls and random breakdowns of generating units. Planner allows for scheduled overhauls by means of its input data and it can model random breakdowns probabilistically, including an optional variance-reduction capability. The above issues are dealt with by Planner optimising the limited resources over the whole long-term study period, and then allocating them to subsequent shorter-term Powerop studies. Planner then collates the results of those Powerop studies together for user-friendly presentation to the user. All of the previously-described tasks are performed automatically by Planner. The use of Planner and Powerop together in this way means that long-term optimisation is combined with a very accurate model of short-term generator scheduling. This makes their results much more realistic than those from the approximate models that are often used for long-term planning purposes. This also means that there is no mismatch between short-term generator schedules and longer-term plans. Most of the features described above, particularly those for reserve and transmission constraints, are relevant to power system operators using the software to schedule and dispatch their power systems in a secure and economic way. The software has some special options for use by generating companies that are self-scheduling under the British Electricity Trading and Transmission Arrangements (BETTA) in the British electricity market. Companies using the software under BETTA schedule their generating units against half-hourly 'Net Contract Positions' in MegaWatt Hours (MWh). The software can model general market prices for electricity, and can also be used to model individual ‘buy’ and ‘sell’ contracts for electricity with their particular characteristics and prices (see the section on electricity contracts above). This provides guidance to the electricity company as to which contracts to accept and at what volumes, in order to maximise profits, whilst taking into account the knock-on effects of accepting those contracts on the outputs of the physical generating units, including the effects of ramp rates. Powerop has an option to calculate the minute-by-minute output profiles for each generating unit for the 'physical notifications' that are required under the BETTA rules. These output profiles satisfy the constraints on the generating units, whilst minimising imbalances between the total integrated output profiles and the Net Contract Positions. The Powerop study period can be up to several days long, with half-hourly time-intervals. Longer-term studies are possible using Planner in conjunction with Powerop. The software can be used to model the Single Electricity Market (SEM) in Ireland and can calculate both 'unconstrained' and 'constrained' generation schedules for that market. The software has an option to predict System Marginal Prices (SMPs) using the rules of the Irish SEM. Powerop runs on a computer with a Windows operating system and is supplied with a sophisticated user-interface based on Microsoft Excel workbooks. Alternatively, it can be used as a solution engine communicating via simple text files with a user-interface developed by the customer, which allows closer integration between Powerop and the customer’s other software systems. The Excel user-interface is recommended for an initial evaluation of Powerop, because it is easy to use and understand. Powerop’s associated program Planner is supplied as an Excel application only. Buckinghamshire, HP9 1JJ, England, United Kingdom. International Telephone: +44 1494 675175.